A stele, often Anglicized as stela, plural stelae (from the Greek stili), is a free-standing stone or wooden slab, generally taller than it is wide, erected for funerary or commemorative purposes, territorial markers, and to commemorate military victories. 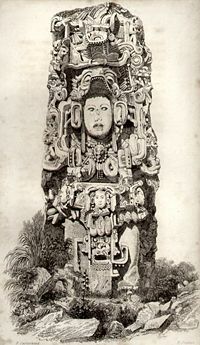 They were a common, though independent, cultural manifestation in all the ancient civilizations of the world, particularly in the Ancient Near East, Greece, Egypt, Ethiopia, and, quite independently, in China and some Buddhist cultures, and, more surely independently, by Mesoamerican civilizations, notably the Olmec and Maya. Today, forms of stele are still used, most often in war monuments. Stelae have provided invaluable evidence to archaeologists of the customs, beliefs, and laws of ancient cultures as many contain long, detailed inscriptions. The Code of Hammurabi was inscribed on a tall stele atop which stands the form of Hammurabi facing the throne of the sun god Shamash, gesturing as if to explain his code which was inscribed immutably in stone. Other significant stelae include the Rosetta Stone, which, inscribed in three languages, was the key to translation of ancient Egyptian hieroglyphic writing. In addition, numerous stelae have been found throughout the world as grave markers and monuments to those who were instrumental in advancing their own society. Interest in the stele phenomenon coincided with the beginnings of archaeology in the mid-eighteenth century, during a time of increased travel and exploration across the globe. In Ancient Egypt, Greece, Mesopotamia, and Mesoamerica, stelae were commonly discovered, although often they were not fully understood. They were usually decorated with names and titles, inscribed, carved in relief (bas-relief, sunken-relief, or high-relief), or painted onto the slab. Since many were found in proximity to burial sites, it was naturally believed that they were tomb or cemetery markers, or were merely part of an ancient affinity for monuments. However, once the old languages, such as cuneiform and hieroglyphics, were successfully translated, scholars soon came to realize that stelae were used for a number of different purposes and constituted one of the largest and most significant sources of information for certain civilizations. In Sumer, stelae were sometimes used as public edicts that informed the public of the laws of the civilization, while in Asia, stelae were occasionally preservations of respected past cultures, left standing for future generations, and relied upon due to their durability against the elements. Stelae in Mesoamerica were often used as markers for the boundaries of large cities, and the Maya often employed them as publications of their elaborate calendar system. No matter how they were used, though, researchers were able to see the distinct cultural imprints left on the structures that offered both explicit and implicit views into cultures long gone. The Code of Hammurabi (also known as the Codex Hammurabi and Hammurabi's Code) was created c. 1760 B.C.E. (middle chronology) and is one of the earliest extant sets of laws and one of the best preserved examples of this type of document from ancient Mesopotamia. 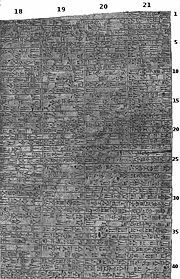 The laws are numbered from 1 to 282 (numbers 13 and 66-99 are missing) and are inscribed in Old Babylonian on an eight-foot tall stele of black basalt It was discovered in December 1901, in Susa, Elam, which is now Khuzestan, Iran, where it had been taken as plunder by the Elamite king, Shutruk-Nahhunte, in the twelfth century B.C.E. It is currently on display at the Louvre Museum in Paris. The Code contains an enumeration of crimes and their various punishments as well as settlements for common disputes and guidelines for citizens' conduct. The Code does not provide opportunity for explanation or excuses, though it does imply one's right to present evidence. The Code was openly displayed for all to see; thus, no man could plead ignorance of the law as an excuse. Scholars, however, presume that few people could read in that era, as literacy was primarily the domain of scribes. Hammurabi had the laws inscribed in stone, so they were immutable. 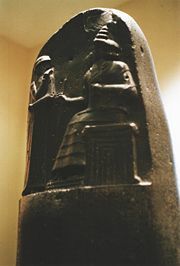 In the upper part of the stela, Hammurabi is shown in front of the throne of the sun god Shamash. The Gwanggaeto Stele (hangul=광개토대왕비 also 호태왕비 hanja=廣開土大王碑 also 好太王碑) of King Gwanggaeto of Goguryeo was erected in 414, by King Jangsu as a memorial to his deceased father. It is one of the major primary sources extant for the history of Goguryeo, one of the Three Kingdoms of Korea, and supplies invaluable historical detail on his reign as well as insights into Goguryeo mythology. It stands near the tomb of Gwanggaeto in what is today the city of Ji'an along the Yalu River, in present-day northeast China, which was the capital of Goguryeo at that time. It is carved out of a single mass of granite, stands nearly 7 meters tall and has a girth of almost 4 meters. The inscription is written exclusively in Classical Chinese and has 1802 characters. 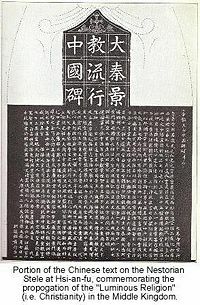 The Nestorian Stele or Nestorian Stone, formally the Memorial of the Propagation in China of the Luminous Religion from Daqin (大秦景教流行中國碑; pinyin: Dàqín Jǐngjiào liúxíng Zhōngguó béi, abbreviated 大秦景教碑), is a Tang Chinese stele erected in 781, which celebrates the accomplishments of the Assyrian Church of the East in China, which is also referred to as the Nestorian Church (albeit inaccurately). The Nestorian Stele documents the existence of Christian communities in several cities in northern China and reveals that the church had initially received recognition by the Tang Emperor Taizong in 635. It is a 279-cm tall limestone block. It was erected on January 7, 781, at the imperial capital city of Chang'an (modern-day Xi'an), or at nearby Chou-Chih. The calligraphy was by Lü Xiuyan, and the content was composed by the Nestorian monk Jingjing in the four- and six-character euphemistic style Chinese (total 1,756 characters) and a few lines in Syriac (70 words). On top of the tablet, there is a cross. Calling God "Veritable Majesty," the text refers to Genesis, the cross, and the baptism. It also pays tribute to missionaries and benefactors of the church, who are known to have arrived in China by 640. 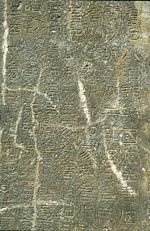 The Nestorian Stone has attracted the attention of some anti-Christian groups, who argue that the stone is a fake or that the inscriptions were modified by the Jesuits who served in the Ming Court. There is no scientific or historical evidence to support this claim. Numerous Christian gravestones have also been found in China from a somewhat later period. There are also two much later stelae (from 960 and 1365) presenting a curious mix of Christian and Buddhist aspects, which are preserved at the site of the former Monastery of the cross in the Fangshan District, near Beijing. The Merneptah Stele (also known as the Israel Stele or Victory Stele of Merneptah) is the reverse of a large granite stele originally erected by the Ancient Egyptian king Amenhotep III, but later inscribed by Merneptah, who ruled Egypt from 1213 to 1203 B.C.E. 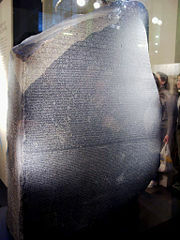 The black granite stele primarily commemorates a victory in a campaign against the Libu and Meshwesh Libyans and their Sea People allies, but its final two lines refer to a prior military campaign in Canaan in which Merneptah states that he defeated Ashkelon, Gezer, Yanoam, and Israel among others. The stele was discovered in the first court of Merneptah's mortuary temple at Thebes by Flinders Petrie in 1896. It stands some ten feet tall, and its text is mainly a prose report with a poetic finish, mirroring other Egyptian New Kingdom stelae of the time. The stela is dated to Year 5, 3rd month of Shemu (summer), day 3 (c. 1209/1208 B.C.E. ), and begins with a laudatory recital of Merneptah's achievements in battle. The stele has gained much notoriety and fame for being the only Egyptian document generally accepted as mentioning "Isrir" or "Israel." It is also, by far, the earliest known attestation of Israel. For this reason, many scholars refer to it as the "Israel stele." This title is somewhat misleading because the stele is clearly not concerned about Israel—it mentions Israel only in passing. There is only one line about Israel: "Israel is wasted, bare of seed" or "Israel lies waste, its seed no longer exists" and very little about the region of Canaan. 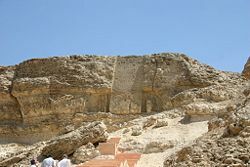 Israel is simply grouped together with three other defeated states in Canaan (Gezer, Yanoam, and Ashkelon) in the stele. Merneptah inserted just a single stanza to the Canaanite campaigns but multiple stanzas to his defeat of the Libyans. 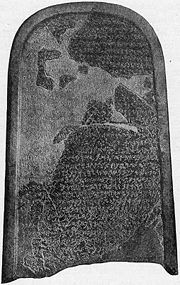 The Mesha Stele (popularized in the nineteenth century as the Moabite Stone) is a black basalt stone, bearing an inscription by the ninth century B.C.E. Moabite King Mesha, discovered in 1868. The inscription of 34 lines, the most extensive inscription ever recovered from ancient Israel, was written in Paleo-Hebrew alphabet. It was set up by Mesha, about 850 B.C.E., as a record and memorial of his victories in his revolt against Israel, which he undertook after the death of his overlord, Ahab. The stone is 124 cm high and 71 cm wide and deep, and rounded at the top. It was discovered at the ancient Dibon, now, Dhiban, Jordan, in August 1868, by F. A. Klein, a German missionary in Jerusalem. "The Arabs of the neighborhood, dreading the loss of such a talisman, broke the stone into pieces; but a squeeze had already been obtained by Charles Simon Clermont-Ganneau, and most of the fragments were recovered and pieced together by him." A "squeeze" is a paper-mâché impression. The squeeze (which has never been published) and the reassembled stele (which has been published in many books and encyclopedias) are now in the Louvre Museum. The Boundary Stelae of Akhenaten maps out the boundaries of the city of the Ancient Egyptian city of Akhenaten. Many of the stelae are heavily eroded, but two of them have been protected and are easily visited. One is in the north of the city boundaries, by Tuna el-Gebel, the other at the mouth of the Royal Wadi. There were two phases of stelae, the four earliest (probably from Year 5 of Akhenaten's reign) were in the cliffs on the eastern bank of the Nile, to the north and south of the city of Akhetaten. These had copies of the same text in which the king told of how he planned the city, and was dedicating it to the Aten. Now as for the areas within these four landmarks, from the eastern mountain to the western mountain, it (is) Akhetaten itself. It belongs to my father Re–Horakhti–who–rejoices–in–lightland. In–his–name–Shu–who–is–Aten, who gives life forever; whether mountains or deserts or meadows or new lands or highlands or fresh lands or fields or water or settlements or shorelands or people or cattle or trees or all, anything, that the Aten, my father has made. I have made it for Aten, my father, forever and ever. A detail of the Raimondi Stela. The Raimondi Stela is a major piece of art of the Chavín culture of the central Andes. The stela is seven feet high, made of highly polished granite, with a very lightly incised design which is almost unnoticeable on the actual sculpture. For this reason, the design is best viewed from a drawing. 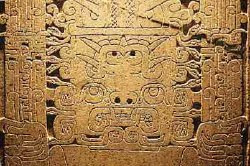 Chavín artists frequently made use of the technique of contour rivalry in their art forms, and the Raimondi Stela is frequently considered to be one of the finest known examples of this technique. Contour rivalry means that the lines in an image can be read in multiple ways, depending on which way the object is being viewed. In the case of the Raimondi Stela, when viewed one way, the image depicts a fearsome deity holding two staffs. His eyes look upward toward his large, elaborate headdress of snakes and volutes. This same image, when flipped upside-down, takes on a completely new life. The headdress now turns into a stacked row of smiling, fanged faces, while the deity's face has turned into the face of a smiling reptile. Even the deity's staffs now appear to be rows of stacked faces. This technique speaks to larger Andean concerns of the duality and reciprocal nature of nature, life, and society—a concern that can also be found in the art of many other Andean civilizations. The Rosetta Stone is an ancient stele inscribed with the same passage of writing in two Egyptian language scripts and in classical Greek. It was created in 196 B.C.E., discovered by the French in 1799, and translated in 1822, by the Frenchman Jean-François Champollion. Comparative translation of the stone assisted in understanding many previously undecipherable examples of Egyptian hieroglyphic writing. The Stone is 45 inches high at its tallest point, 28.5 inches wide, and 11 inches thick. It is inscribed with a decree setting up the cult of the pharaoh for Ptolemy V who was the fifth ruler of the Hellenistic Ptolemaic Dynasty. The Greeks had ruled Egypt from 305 B.C.E., after the conquest of Persia by Alexander the Great, until 30 B.C.E. Before the Greeks, Egypt had been conquered by Persia and when Ptolemy I was appointed the ruler of Egypt, he was welcomed into Egypt as part of the family of Alexander. Greek language and culture flourished for hundreds of years in Egypt alongside the native Egyptian language and culture. Thus, the text on the Rosetta Stone was written in both Greek and Egyptian scripts. Ptolemy V began his rule when he was five years old, and thus much of the ruling of Egypt during his reign was done by Regents and royal priests. With the Rosetta Stone, these priests continued the precedent set by Ptolemy III (whose decree appears on the Stone of Canopus) of issuing decrees to the populace, instead of the pharaoh himself, in order to maintain support for the dynasty. They had the decrees inscribed on stone and erected throughout Egypt. The Rosetta Stone is a copy of the decree issued in the city of Memphis upon the coronation of Ptolemy V when he was 13 years old. ↑ Louvre, Law Code of Hammurabi, king of Babylon. Retrieved March 23, 2007. ↑ A.C. Moule, Christians in China before the year 1550 (Octagon Books, 1977, ISBN 0374959722). ↑ Carol A. Redmount, "Bitter Lives: Israel in and out of Egypt" in The Oxford History of the Biblical Word. Michael D. Coogan (ed. ), (Oxford University Press, 2001, ISBN 0195139372). ↑ Ian Shaw & Paul Nicholson, The Dictionary of Ancient Egypt (British Museum Press, 1995, ISBN 978-0714119533). ↑ Joseph Jacobs and J. Frederic McCurdy, Moabite Stone. Retrieved August 14, 2007. ↑ Amarna Project, Boundary Stelae—Amarna The Place. Retrieved August 14, 2007. ↑ James H. Breasted, Ancient Records of Egypt: The First Through the Seventeenth Dynasties, Vol. 1 (University of Illinois Press, 2001, ISBN 0252069900). ↑ George and Audrey DeLange, National Museum of the Archaeology, Anthropology, and History of Peru. Retrieved August 14, 2007. Hasel, Michael G. 2004. "The Structure of the Final Hymnic-Poetic Unit on the Merenptah Stela." Zeitschrift für die alttestamentliche Wissenschaft. 116:75–81. Kuentz, Charles. 1923. "Le double de la stèle d'Israël à Karnak." Bulletin de l'Institut français d'archéologie orientale 21: 113–117. This page was last modified on 22 October 2015, at 19:25.